I've mentioned on here a few times over the years that I have a thing for palindromes. It's weird, I know. But I dig them. This entire week is a palindrome! Hot diggity dog...I love it! For anyone who missed said episode of 3-2-1 Contact or that math lesson, a palindrome is the same forwards and backwards. Hannah, dad, 56765....they are the same word or number if you read them from the right or left. What's your favorite word? Is it less nerdy than mine? 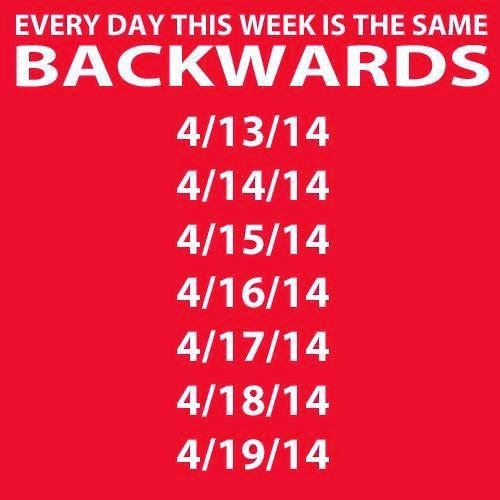 Are you, too, a fan of palindromes and secretly excited that it's palindrome week? actually 4/10/14 and 4/11/14 were palindromes too. i LOVE palindromes. I used to have a phone number that was a palindrome (531-3135) and both my brother and I graduated in palindromic years (1991 and 2002). Palindromes totally rock!